Milton's Elise O'Leary ran a state best in the 400m at Sunday's meet. It was a banner day for several athletes at the Eastern Division 3 Championships, held Sunday in Burlington. 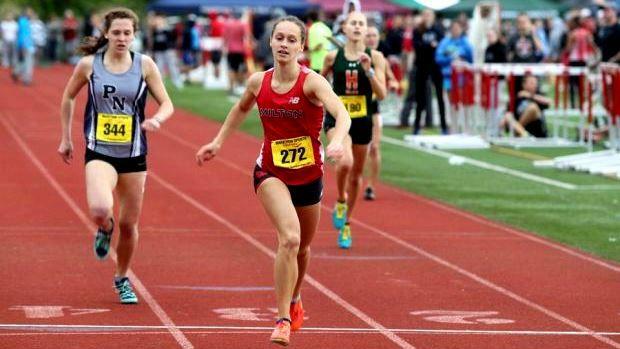 In the girls' competition, three state best were established in the five-plus hour meet. Milton's Elise O'Leary held off Plymouth-North's Caitlin Haley to win the 400-meter dash in a state-leading 56.85 seconds. Haley secured runner-up honors with a 57.53 clocking. Tewksbury's Lauren Polimeno beat the field in the 400m hurdles where she ran a No. 1 of 1:03.26. Chloe Eressy of Dennis Yarmouth heaved the discus a distance of 126 feet, 2 inches, tops in MA. Tewksbury's Rachel Sessa captured the mile and the 800m. She was timed in 5:03.17 for the mile and a quality 2:14.17 for the two-lapper. Dracut's Mikaylah Schwartz and D-Y's Eressy both exceeded 40 feet in the shot with tosses of 40-5 and 40-3.5, respectively. Foxboro's Shraeya Srinvason continued her strong season in the triple jump with a leap of 39-11.75. Milton's Smith Charles leaped 23-6.75 in the long jump. He also took care of both sprint events, taking the 100m in 11.02 and the 200m in 22.03. Melrose Kevin Wheelock beat the field in the two mile with a time of 9:26.33. Wakefield Memorial won a tight race in the 4x800m where the top 3 teams were separated by less than two seconds. Wakefield was timed in 8:12.96. Pembroke finished second in 8:13.04 and Melrose secured third at 8:14.87. Burlington's Fernando Lamin cleared a PB of 6-8 in the high jump.